WE DESIGN STAMPED CONCRETE PATIOS TO PERFECTLY FIT YOUR HOME. Stamped Concrete is becoming increasingly more popular and the concrete of choice for most Sterling Heights MI homeowners. Because Biondo Cement, Inc. specializes in Sterling heights poured concrete, we’re able to offer a wide variety of colors, patterns, finishes and design options to our Sterling Heights, MI customers. Our team of Sterling Heights stamped concrete contractors have decades of experience and use “state-of-the-art” tools and equipment when installing the product. Our expertise insures your project will be done both professionally and in a timely manner. We are fully licensed and insured and back up our commitment to quality and complete customer satisfaction with a 1½ Year Warranty on workmanship and materials. All stamped patios must be inspected by a Building Inspector Official and must be approved by the Building Department. Stamped concrete in Sterling Heights MI is very affordable, and the choice of many homeowners looking to stretch their dollars. If you’re thinking about replacing your driveway Biondo Cement is the best choice for quality, workmanship, and affordable driveways. Biondo Cement has excellent rating with the Better Business Bureau and we are licensed and insured with the State of Michigan. To reveal the beauty of exposed aggregate, first pea stone is used in the concrete mix rather than the limestone aggregate. Next after pouring and finishing the cement a retarder is applied to the surface to prevent the top layer from drying. Biondo Cement has been hard at work to provide the industry’s most unique techniques when it comes to exposed aggregate concrete. Due to the boom in popularity of exposed aggregate patios and driveways, we are now providing homeowners with stunning designs and outstanding quality finishes. We have developed new methods of incorporating both stamped concrete and exposed aggregate in patios by exposing the pea stone on the inside of the patio, leaving the border and facing with a natural stone and stone texture finish. It is a simple yet stunning look giving homeowners the best of both worlds when it comes to decorative concrete. Check out examples of this finish in the Exposed Gallery. When a homeowner thinks about a shape for a patio, they should take into consideration where their patio furniture is going to be placed. Once that is established we can start on your patio design. 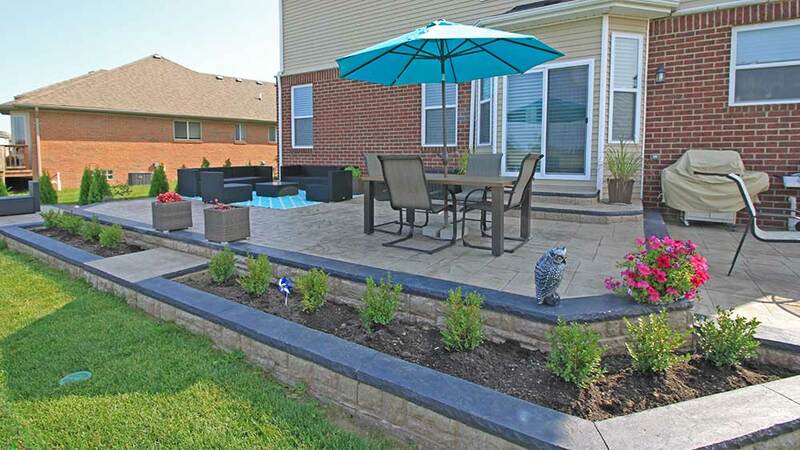 We will make sure that not only does your patio have an elegant look, all your space will be utilized comfortably. There are many different different types of concrete pool decks that homeowners can choose from. You will find that a poured concrete pool deck is a great place to relax in the sun when you are not in the pool. Decorative concrete is just one version of many different ways to describe “stamped concrete”. Biondo Cement has created a video that shows customers all the details involved to create a custom decorative stamped concrete job, simply click here to view our concrete videos. Homeowners in Sterling Heights, MI are discovering the many great advantages to decorative stamped concrete. Biondo Cement Co. is a Michigan based concrete contractor, fully licensed and insured, a member of the Better Business Bureau and is your local decorative stamped concrete contractor located in Sterling Heights, MI.